This is money from Africa. Mozambique, or Mozambique as most of us know it now, is a strangely shaped nation (but aren’t most?) on the eastern side of Africa. It would have been larger but I’m guessing Madagascar split from it millions of years ago, perhaps over some trivial dispute. 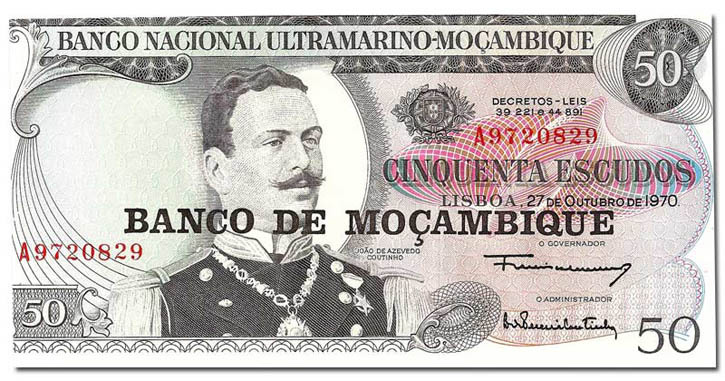 I have no idea who Joao de Azevedo Coutinho was, but since he merits his mug on the front of the bill, an early manifestation of Portuguese rule seems likely. If the design does indeed date from 1970, that’s a rather strikingly modern bill.